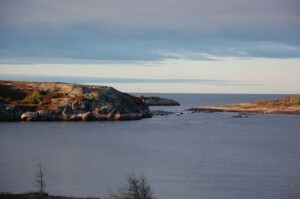 We are located at the confluence of the Corneille River and the majestic St-Lawrence Gulf, on an island formed by one of the oldest granite formations in the world. The water that surrounds the island is salt water. With its string of a dozen buildings, the La Corneille River Outfitter is an EXCLUSIVE RIGHTS Atlantic SALMON RIVER that offers a mix of fishing and leisure. The island is located less than a kilometer from the main road on hwy 138 at road marker 1279, about 40 miles east of Havre St-Pierre, in the heart of the Mingan Archipelago National Park Reserve of Canada directly across from Anticosti Island. 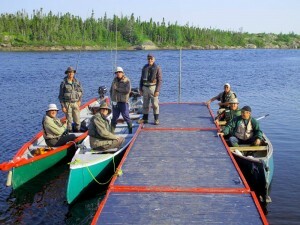 Come for a river, lake and ocean experience with personalized service – one guide per two anglers. Atlantic salmon, sea trout, speckled trout, Landlocked arctic char and landlocked salmon. Please take note that “catch and release” is imposed on all big salmon. 12 miles of exclusive rights on La Corneille river. Lake Tanguay has 15 miles of shoreline to explore. 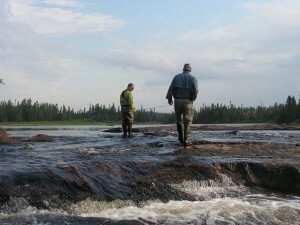 You can fish for trout, arctic char, and landlocked salmon. There is a shelter where your guide can cook your lunch or it can be used for an afternoon rest. Take a boat tour or paddle a kayak along the coast. Collect mussels, clams & sea urchins. You can spot whales and sea lions bobbing in the bay just in front of the island. It is possible to hire a float plane or helicopter to explore the rarely fished territory on Lake Turgeon at the extremity of the exclusive rights river territory.